If you're not familiar with the title of the post it's a knock-knock joke. And it's completely irrelevant to this post. 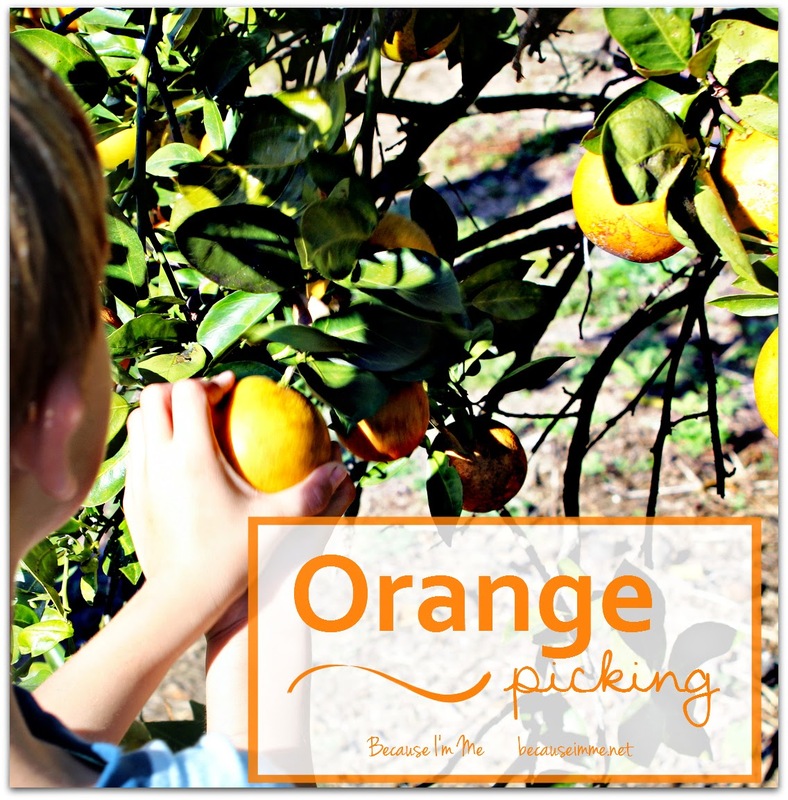 Last week we took an afternoon and went and picked oranges at a local grove. Straight off the tree. We do this every year or two, always trying to go before Christmas because the Pineapple Oranges are our favorite and are ripe in December. This year we tried Arizona Sweet Oranges and found those to be sweet and juicy too. A full five gallon bucket of fresh oranges costs just $13. A five gallon bucket will fill two plastic shopping bags full ... a pretty awesome deal for $13. The oranges are grown organically, without pesticides. Yes, they have some seeds and the skins aren't super duper orange and waxy, but the insides are "to die for" and picking it yourself makes it even more special. One delightful bonus of orange picking is being able to eat while picking, which makes a visit to the orange grove a little sticky but the kids love just tossing the peels on the ground as they wander about and randomly picking and sampling the many varieties of oranges, limes, grapefruits, and other citruses. Be warned: not all citrus fruits are as they seem, Ian tried a lovely little very orange orange that turned out to be a sour lime. This year at the grove the kids were given Citra Sippers to take home. Apparently, everyone in south Florida but me has a pile of these mixed in with their kitchen utensils. I'd never heard of them. After 30 years in Florida. I guess I've been living under a rock. Sad, because these things are pretty dang cool. All you do is stick the sipper into the top, where the stem was, squeeze the orange, and sip. After enough squeezing and sipping the orange is juiceless and the sipper is happy. Pretty darn cool, and they're causing my stock of oranges to dwindle pretty quickly ... we may just have to hit the grove again before spring. The grove is heavily guarded by Bob, their slightly chubby beagle (there's a picture of Bob here) and the pond in the back has banana trees and a wild alligator known as Hannah, who wasn't visible the day we were there. So .. we don't get to go out into the woods to pick our own Christmas tree, we can't stick things into trees for maple sap, and we don't go apple picking, but we do get to hang out in an orange grove when it's 80' in the middle of December so I think we're doing alright.